How do I use Custom Tags? Custom tags allows you for the first time to associate custom data with a page view on your website beyond what StatCounter records as standard, to help give you new insights into your traffic. For example your website may have a user login system, and you may want to tag a page view with the username of the visitor loading the page. Or you may want to have custom variables associated with a page view to help with split testing. Effectively you can now tag and segment your traffic in whatever way you wish! Note: The above is just a sample - the tags object can contain any name/value pairs you like! That’s it! Complete these edits and upload them to your website. When viewing various StatCounter reports, including Recent Pageload Activity, Recent Visitor Activity or when magnifying users, you should now see an extra column for ‘tags’, showing you any tags associated with the page views. In the case of Recent Visitor Activity, tags that have a consistent value across all page views in a visit will be associated with the visitor. For example, if all page views made by a particular visitor were tagged with the same user ID, the user ID will be shown as a tag for that visitor. You will also find your custom tags added to the filter options on several StatCounter reports alongside the standard filter options. This will give you the flexibility to filter and segment your log based on custom tag values. 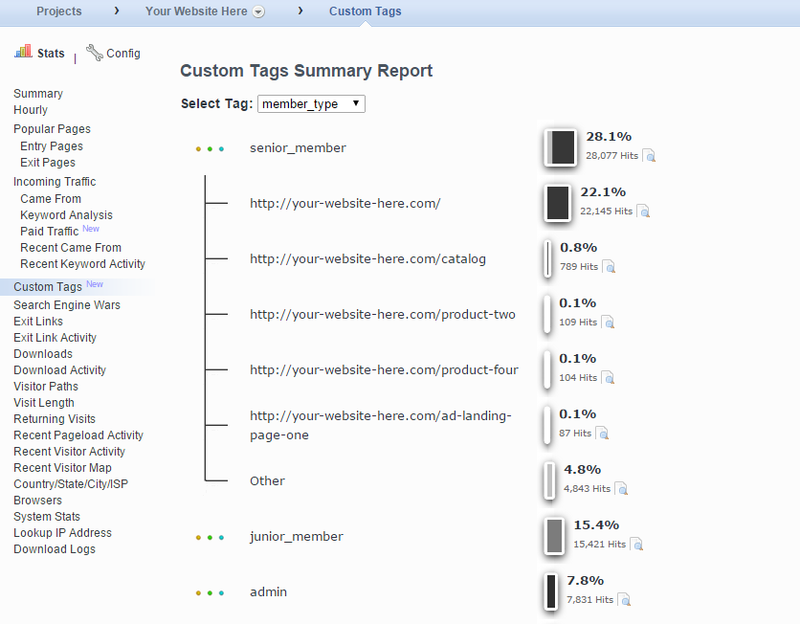 The new Custom Tag report gives you a summary of tag data recorded in your log. For each tag type, it will show you a breakdown of the values recorded for that tag, and the percentage of page views in your log tagged with each value. You can click a value to get a further breakdown of the top 5 URLs recording that tag value. This report is designed to give you an easy way to see how your traffic is divided between different tag values. For example, if you record a ‘logged-in’ tag, that is true if the visitor is signed in and false otherwise, you could quickly see the percentage of traffic on your site generated by logged in users vs anonymous users. And you could see which pages on your site are most popular with signed-in users alone. Or if you’re trying to optimise your site with split testing, you could tag a goal page with variables describing the content seen by that visitor, allowing you to easily segment converting traffic by whatever criteria you need.